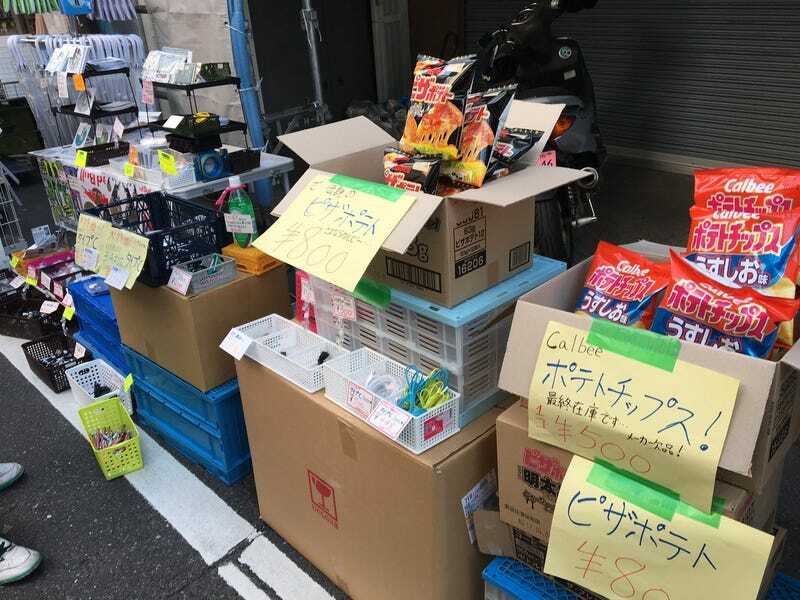 With select brands of popular Japanese potato chips vanishing from store shelves, folks are hoping to cash in. As Kotaku reported last week, panic buying began at some stores after snack makers said they were either suspending or ending potato chip production due to domestic spud shortages. This isn’t happening at every store (some are still fully stocked! ), but it certainly is happening at a lot of them. Moreover, not all brands are effected and thus, those chips remain widely available. The ones that are impacted—such as Pizza Potato, which won’t be produced anymore—are seeing a spike in online resale. On Sunday in Tokyo’s Akihabara, one rather suspicious looking man was spotted selling Pizza Potato for 800 yen a bag, which is about six times it’s original price. Calbee’s Big Bag Lightly Salted, production of which is being suspended, was also being sold at a significantly marked up price. And yet, there are still sell outs.